New riders, parents and pit racing zealots come in many size and experience levels, so why relegate them to simple one-sized machines? 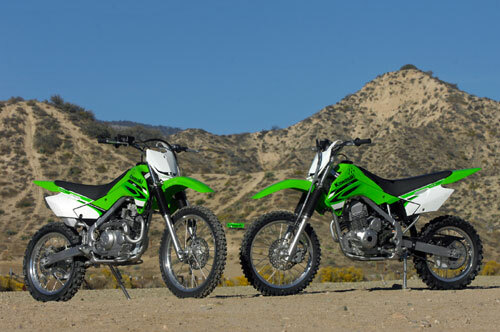 That’s exactly the question Kawasaki’s engineers pondered before creating the new KLX™140 and 140L dirtbikes. To help satisfy a wide variety of riders in the small displacement off-road arena, this new model is offered in two wheel sizes, the more elementary 17” front / 14” rear wheeled KLX140 and the larger 19” front / 16” rear wheeled KLX140L. Both are designed to be friendly for beginners and novices, while also offering a roomy layout and enough performance to suit more-advanced riders. An orange LED inside the on/off switch illuminates to indicate when electrical power is “ON” and the fun begins as soon as the rider’s thumb meets the KLX140’s electric start button. 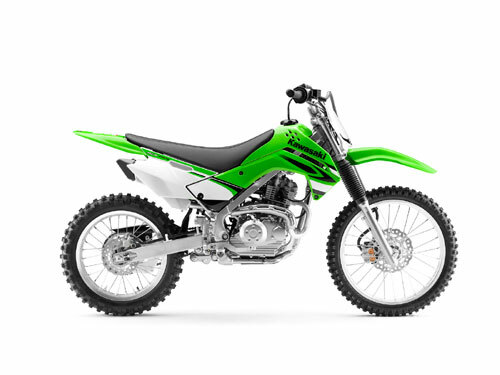 The high-revving, yet quiet, engine is wrapped in a high-tensile steel perimeter frame that uses the same upper tubes as the KLX250S and is covered by KX™-like shrouds, while a two-tone seat cover and sharp, aggressive body work complete the modern KX-inspired design theme. The 140’s controls also share KX genes, from the same grips as the top-level MX racers to the narrow footpeg/frame relationship combined with large footpegs that make it easier for the rider to move around with a minimum of effort. 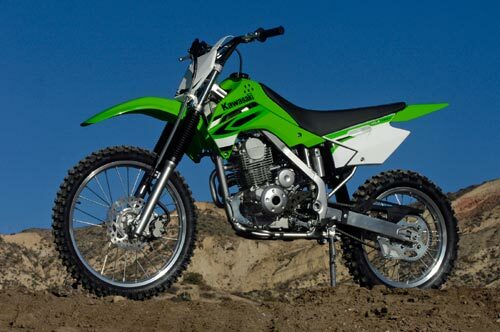 This model’s KX influence is more than skin deep; its development team not only included young test riders, but also pro SX/MX racers and Kawasaki’s motocross engineers to give the KLX140 the same pedigree as the World Champion KX models. 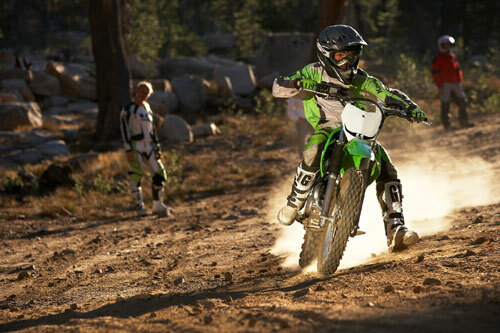 The effects of this talented group are evident in the KLX 140’s ergonomically friendly layout, responsive engine power, five-speed transmission and dirt-worthy suspension. Both variants have a 33mm fork with spring rate and damping settings specific to each version. The KLX140 rear shock features 5-way preload adjustability, while the larger KLX140L’s aluminum shock includes a piggyback reservoir, fully adjustable preload, 4-way compression and 22-way rebound damping to suit high speed operation by heavier riders. To provide more options for growing riders; the standard KLX140 is also capable of accommodating the more-advanced shock from the KLX140L. Abundant power from the air-cooled SOHC 144cc engine flows through a five-speed, close-ratio transmission that contributes to the KLX’s accelerative performance. Its manual clutch offers young riders the chance to master full control over shifting. To promote an easy learning curve, the clutch features a spring damper that provides a progressive, two-stage engagement and facilitates half-clutch use while riding at extremely slow or idling speeds. Additional benefits of this system are a more direct clutch feel and increased durability. RK EXCEL aluminum rims and high-grade die-cast hubs are another sign this isn’t your little sister’s play bike. A large 220mm front disc and 27mm twin-piston caliper at the front and a 186mm rear rotor grace the KLX140L with serious stopping power. Both use petal shaped discs, which help clean the brakes and reduce unsprung weight for better performance. An ideal blend of small stature and big potential that simply equals fun for most rider sizes from kid to adult, the new KLX140 and KLX140L promise to rewrite the playbike rules. – Durable, lightweight RK EXCEL aluminum rims. – Front 220mm petal disc and large-bore 27mm twin-piston caliper (same size as those on the KX450F/250F) for strong and easy-to-control braking. – Rear wheel is slowed by a 186mm petal disc gripped by a 27mm single-piston caliper. Rake / trail: TBD degrees / TBD in. Rear suspension / wheel travel: (KLX140L) UNI-TRAKÃ‚® linkage system and single shock with 5-way preload adjustability, (KLX140LL) UNI-TRAKÃ‚® linkage system and single shock with piggyback reservoir, fully adjustable preload and 22-way rebound damping / 7.1 in.